A more efficient way to secure a tie for re-spiking. Takes the place of old-fashioned nipping bars. After inserting the replacement tie under the rails, Tie Snugger is placed across the ties on either side of the new tie. 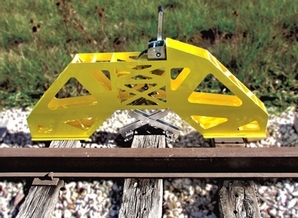 A set of grab tongs is placed on the tie and connected to the lifting crank with a synthetic strap. The tie is then pulled up against the rail base with enough holding power to permit re-spiking. Once re-spiked, the new tie is ready for ballasting. Hand holds on the top of Tie Snugger make for easy transport. • 36" long x 8" wide x 24" tall.